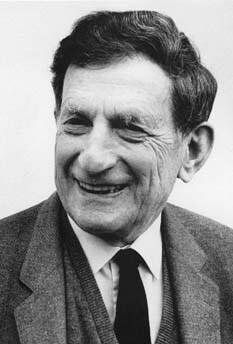 David Bohm was an American theoretical physicist who would later become a citizen of the United Kingdom. After finishing his undergraduate degree at the Pennsylvania State University in 1939, Bohm arrived at the University of California, Berkeley on a seemingly meteoric rise. However, during this same period he became affiliated with the Communist Party, which would ultimately undermine his chances for success in the United States. After being investigated by the House Un-American Activities Committee in 1950, he was forced to continue his study of physics in other countries. In this interview, he discusses his time at Berkeley before and during the war and the left-wing movement at Berkeley. He describes his former mentor J. Robert Oppenheimer as a brilliant mind with occasional charisma that made him a strong administrator. Bohm: At Pennsylvania State College. Now it’s called Pennsylvania State University. He used to come down there for a month or so every year, and I met him. He suggested coming up to Berkeley, and so I came up that fall. Sherwin: What impressed you about him? What made you think you’d like to work with him? Bohm: Well he seemed, you know, more lively, and he was more interested in general ideas than anybody at Caltech. They were rather narrow in what they wanted to do, solving very limited, specific technical problems. So it seemed that that would be better. Sherwin: Did you have a series of problems that you were working on at that point that interested you, or were you still fishing around? Bohm: No, there was a fellow called Epstein who had proposed a problem, but I didn’t particularly like it. It was some calculation of scattering of light by dust in interplanetary space. It finally resolved itself through a rather complicated set of calculations, and I didn’t see the value of doing that. Oppenheimer seemed to have a more general interest in what physics was about. Sherwin: You had been at Caltech for one year? Bohm: Well, that was the second year. Sherwin: Second year. Did you know Frank Oppenheimer? Bohm: I met him also up at Berkeley. Sherwin: At Berkeley. He was at Stanford at the time, I guess, when you were at Caltech. So you moved up to Berkeley, and this is 1941? Sherwin: The fall of ’41? Bohm: Yes. Well, I really got up there about June, I suppose. I attended seminars and met people there and began to work on some sort of formula. Sherwin: What problem did you work on? Bohm: Well, I can’t remember exactly. It started out with some sort of problem of scattering the neutrons and deuterons and they carried that a certain distance. Then I finally felt, you know, that the thing was too ambiguous to be completed. But later on, I combined that with some work on scattering of protons on protons to get a thesis. Sherwin: When did you complete your thesis? Bohm: I think it was in ’43 or thereabouts; ’42, ’43. Sherwin: Was Oppenheimer the primary director of the thesis? Bohm: Yes. Well, he wasn’t around a great deal, but the war came shortly after and shortly after that he became involved, mainly radiation work in the military research. Sherwin: So you were working pretty much on your own? Sherwin: You finished it in ’43? Sherwin: Where were you working? Were you at the Radiation Lab? Bohm: Well, I was just a teaching assistant there. I finished my Ph.D, and then I went into the Radiation Lab. Sherwin: I went through the Oppenheimer hearings this morning. You have been through them, I assume? Bohm: Perhaps. I mean, I think it was some time ago. Sherwin: Right. There’s a whole series of accusations that are very vague. You and [Giovanni Rossi] Lomanitz and Max Friedman and David Hawkins. They sort of put the four of you into a category as security risks. It’s stated in the hearings that as far as you’re concerned, what Oppenheimer was told the reason that you can’t be cleared for the Los Alamos project was because you had family in Germany. Bohm: That was what he told me, yeah. Sherwin: That was what he told you? Bohm: Well, at one moment, I felt regret that I couldn’t go there, because everybody else was going there. But I thought it would be rather isolated, which in fact it was. In the long run, I think it turned out for the best that I didn’t go. I don’t think it would have been very interesting to me, now that I know what they were doing there. I wouldn’t have been very interested in it, anyway. I probably found it more interesting to stay where I was in Berkeley, although I had to go through about or year or two of nobody really to talk with. But eventually [Harrie] Massey and [Eric] Burhop came from England and began to do plasma work, which probably was more interesting than anything I could have found to do out at Los Alamos. Sherwin: So the general, word was out in terms of the young physicists that if you could get to—did they know it was Los Alamos, or just know it was—? Bohm: It was New Mexico, that’s all I knew. Sherwin: New Mexico, that everybody was there? Bohm: Yeah, well, there was a big project going on out there, working on things that might be very important. That’s all. Bohm: Well, I think we knew that it had to be something associated—everybody knew you were working on uranium that involved a liberation of atomic energy. You could guess that it was a bomb, but you couldn’t be sure. Sherwin: Hawkins wasn’t a physicist, was he? Bohm: No, I hardly knew Hawkins. I mean, I may have met him once or twice before at that time. I met him later in Geneva long afterward, at a conference with [Jean] Piaget. But I don’t think I knew Hawkins. You know, met him once or twice. But I don’t know why he’s lumped in with us. I don’t think any of us saw much of him. Sherwin: I think the reason is that he was also accused of either being a communist or being a fellow [inaudible]. Bohm: Yeah, well, we hardly knew Hawkins. Sherwin: Did you ever talk about Oppenheimer with Hawkins? Bohm: No. No, I think none of us was—see, the three of us in the department there were Lomanitz, Friedman, [Joseph] Weinberg—the four of us, myself. We had close contact, because we knew each other, and we may have met Hawkins once or twice. Perhaps some of the others knew him better, for all I know. Sherwin: Yeah. Now, what’s your sense of the charges against Lomanitz and [Bernard] Peters and Weinberg? Bohm: What were the charges? Sherwin: Well, it’s all very vague, which is one of the real problems. But basically, that the only thing we know is that they were suspected of being either communists or sympathetic to communism. Lomanitz, [John] Lansdale, who was the security officer, stated that he had been too loose with information. Bohm: Well, I couldn’t say anything about looseness with information. Bohm: See, I’ve no evidence that Lomanitz was loose with information. But certainly we were all close to communists at the time. I might have stated so in the cases. At that time it wasn’t regarded as so bad, because the Russians were our allies. Bohm: But I have no evidence of looseness of information. Sherwin: What was your association with the left, to put it generally? Were you a member of the Communist Party? Bohm: Well, for a short time, yes. Sherwin: You were. When was that? Bohm: I can’t remember.’42, ’43. Sherwin: Frank Oppenheimer has stated that he was a member from, was it ’36 to ’38. Bohm: Yes, I had no contact with him. I wouldn’t know anything him except what he said. Sherwin: What led you to join the Communist Party at that time? Sherwin: Let me tell you why I’m asking this. I’m trying to incorporate, of writing this book, about the period of the ‘30s, to try and get a feeling, sort of a portrait of academics who had left-wing sympathies, and why the positions that the Communist Party took appeared to be attractive to them. Bohm: Until, say in 1940 or ’41, I wouldn’t have had much sympathy with the Communist Party. Sherwin: How old were you in ’41? Bohm: I was about—1917 I was born. Sherwin: Okay. I’ll work it out from that. Bohm: ’37 was twenty years, so I would’ve been twenty-four. The thing that deeply impressed me was the collapse of Europe in the face of the Nazis, which I felt was due to the lack of will to resist, that there were a lot of people there who preferred them to the Russians. I felt that there was such a trend in America, too. I thought the Nazis were a total threat to civilization, or to mankind. That if they won, it was a total threat, and therefore, that they were completely in favor of irrationalism. It seemed that the Russians were the only ones who were really fighting them. That was the main thing. Then I began to listen to what they said more sympathetically. Sherwin: Did you come from a family that was particularly political? Sherwin: They were sort of Roosevelt Democrats? Bohm: Yeah, more or less. Well, actually, my father had some sympathy with Mussolini, thought he’d bring order. We used to argue about that. Naturally, he had no sympathy for Hitler. Sherwin: Yeah, yeah. That was in the earlier ‘30s, I suspect. Sherwin: There was a lot of that before Hitler came to power, or shortly thereafter. Now, how about your sense of—my sense of Lomanitz, who I haven’t spoken to. Where is he, by the way? Bohm: He’s in New Mexico. Socorro, New Mexico. Sherwin: I’m going to New Mexico on July 10th. Bohm: Socorro, and it’s the School of Mines there. Sherwin: Socorro, New Mexico. Can I just write to him? Bohm: Well, I suppose you can. Bohm: I forget. You must find out what it’s called. It’s a University of New Mexico, the School of Mines, I can’t remember now. He’s most likely to be there, at least you can trace him from there. Sherwin: Okay. And Max Friedman? Bohm: Max Friedman’s in Puerto Rico, but he’s retired from the University of Puerto Rico. He’s called Manfred down there now. Sherwin: Okay. I was going to ask about your sense of Lomanitz’s politics and relationship to the kinds of suggestions that were made by the security officers about him. Was he very much an active and committed-type political activist? David: I think he tended favor activism, yes. No doubt about that. Sherwin: Was he a member of the Communist Party? Bohm: I think you should really ask him. Sherwin: I should ask him. Right, okay. Fair enough. Sherwin: Could you tell me more about when you joined? What was it to join? Bohm: Nothing. Essentially, I began to feel that they did nothing but talk about things of no significance, about trying to organize protests of affairs on the campus, and so on. Sherwin: Was it a campus chapter? Bohm: Well, it was more or less campus, yeah. Sherwin: Did you go to meetings? Bohm: A few meetings, yes. The meetings were interminable, discussing all these interminable attempts to stir up things on the campus, which really didn’t amount to much. Sherwin: Anything else with a large group? Sherwin: Was it mostly academics at Berkeley? Bohm: Oh, I can’t even remember too well. It was a mixture of different kinds of people. Sherwin: Now, you asked Oppenheimer to go to Los Alamos in March of ’44. You had already finished your PhD? Bohm: Yes. Well, in fact, at first he was saying that I would go. Then I found out, he said I couldn’t go. Then I sort of asked him if we couldn’t have that changed. Because at that time I felt I would be very isolated at Berkeley. Bohm: I more or less suspected that they might have thought it was my politics. But, of course, I had no way to prove any of that. It seemed plausible. Sherwin: Now, when you testified before HUAC in May of 1949—and this question is as much for a friend of mine as it is for me, who’s writing another book. I’ll tell you about it in a minute. Bohm: I think some friends of ours, whose name I can’t remember, got us to Durr. I can’t remember who they would’ve been. Maybe it was Ed Condon. Sherwin: Could very well have been Condon. Bohm: They got us in touch with Durr. No, actually, somebody told me about Abe Fortas and I tried to talk with him. I may have had a little talk with him, but it may be that he put us onto Cliff Durr. Like I say, I just can’t remember. But when we talked it over—my memory of the period is rather sketchy. We stayed at Ed Condon’s [inaudible]. Sherwin: This was in Washington. Sherwin: Okay. Do you remember your impressions of Durr, or any advice that he gave you? Bohm: He seemed a sympathetic pers. We talked it over and he seemed like he sympathized with what I was doing. So he presented the case and I decided to refuse to testify. Sherwin: Now, you must have discussed this whole thing with him? Sherwin: Was this before or after Frank Oppenheimer and Jackie Oppenheimer had testified? Do you know? Bohm: That I can’t remember. No, it was all such a jumble. Bohm: Yeah, well, I was advised that if I did that, then they could put you in jail. Sherwin: That’s right. Yeah. Durr had advised them the same, but they were adamant for some reason to do it that particular way they decided upon. Do you remember any of the discussions with Durr? This came up, in other words? Bohm: Yeah, I’m sure we discussed all that, yeah. Sherwin: Did he see you and Lomanitz together? Bohm: I think we did. It’s such a long time ago. Sherwin: Sure. No, I know, but I’m going to try. Bohm: I imagine we did. I think I may have seen him alone and with Lomanitz on different occasions. Sherwin: Do you remember anything about your sense of him as a lawyer? Bohm: I can just say that I had confidence in him. He seemed friendly and helpful. Sherwin: He went to the hearings with you? Sherwin: Were they open or closed, or both? I know some of them were open. Bohm: They were open. They were all open. Sherwin: They were all open. Do you remember any particular advice that he gave you at the hearing? Bohm: No. There wasn’t a lot to advise. I think the position was clear. He may have had to say once in a while two words to me at the hearing, but the whole thing was fairly clear. Sherwin: Did you pay him a fee? Bohm: What happened was that the second time I went to the—he referred me to somebody who was no longer in Washington. Later, when I had my Contempt of Congress, there was a fellow called [Harry C.] Lamberton who defended me there, who Durr put me in touch with. Sherwin: When was the second? Bohm: We’ll come to that. I remember paying Lamberton a fee. But I don’t recall—if I paid Durr a fee it was very modest. It was just to cover expenses. That’s about all that would’ve been paid to him. Sherwin: You were an assistant professor at that time? Bohm: No, I was still an assistant professor, I was under contract. As a matter of fact, several years later I was indicted for Contempt of Congress and acquitted. But Lamberton defended me then. My contract ended just about that time, so I remained at Princeton University until 1951, summer of 1951. Sherwin: When did you first go to Princeton? Sherwin: Was it a four-year assistant professor contract? Bohm: No. They gave me one and there was one and a half years, and then I got a three-year contract. Sherwin: Was everything going along well at Princeton until this hearing in ’49? Bohm: Yes, oh, yeah, yeah. Sherwin: Could you tell me about the Princeton experience? How it became public knowledge that you were being called before HUAC? Bohm: Well, it was put in the papers. Sherwin: Okay. How did the university react [inaudible]? Bohm: Yeah, the thing was put in the papers. Some of the New York papers carried headlines on “Princeton Prof Balks Quiz,” was the headline. Bohm: “Balks Quiz,” yeah. The thing was public knowledge, obviously. Now, at first they didn’t say anything for quite a while. Bohm: Was [Allen] Shenstone. [Henry DeWolf] Smyth for a while, but Smyth had already gone to the Atomic Energy Commission, and Shenstone was now. At one stage, about a year later, Dodds called me in, a year and a half later, and said I should testify. He implied it, anyway. Sherwin: Can you remember more about that? Bohm: He felt there was no justification for not testifying. Sherwin: This is in 1950? Bohm: About ’50 or thereabouts. Sherwin: Six months, a year after your hearing? Bohm: About a year. He didn’t say anything more than that. Sherwin: Had you ever met him before? Sherwin: He just called you in? Bohm: We talked it over, and he sort of kept on intimating that it would best to testify. Sherwin: What did you say in response? Bohm: Well, I couldn’t give much of an answer. That was about all. The Physics Department did back me up, most of them. When they heard [inaudible] that they weren’t going to renew the contract, they went to the president, most of them, including the head, Shenstone. They made a strong representation, but it wasn’t able to change anything. Sherwin: In other words, it was Dodds who decided that your contract would not be renewed? Bohm: That’s right. Yeah. It was primarily Dodds, yes. Sherwin: Then what? What time of the year was it? Bohm: It was November I was indicted for Contempt of Congress, and I was suspended. Bohm: 1950. Then I was suspended with pay, because I was on contract. Sherwin: Why were you indicted? Bohm: Contempt of Congress, because I hadn’t testified. At that time, it wasn’t clear whether you had the right not to testify on the basis of self-incrimination. They argued that being a member of the Communist Party was not officially a crime, therefore, the government was arguing that therefore you had no right. Meanwhile, about March, the Supreme Court made a decision on one case that they did have the right, and I came to trial in June. But by that time, of course, the issue was decided. Bohm: When I was suspended, I was not supposed to appear on the campus. Sherwin: How did something like that come about? Sherwin: That you couldn’t appear on campus. Bohm: That was the terms of the suspension. All I know is that they sent me a letter, and that was it. Sherwin: You’re a theorist, right? Bohm: No. In fact, it was a big boon, because I had a lot of time to myself, and I would do a lot of work. I really was able to do my work much better. Sherwin: You weren’t so disturbed by this whole thing that it made it impossible to work? Sherwin: What was your attitude towards academia, your colleagues in general, with all that was going on? Bohm: They were sympathetic during this period. They didn’t understand what it was all about, because I couldn’t explain it to them. But they were at least sympathetic. Most of them, not all of them, but most of them. But I was finding anyway that in the university there’s a kind of pressure, a very subtle pressure, to work on a certain line. Which, as a result of being suspended, I was sort of freed from the pressure and then I was able to move more freely. Because it’s not that people are putting you under pressure, but just simply to be able to talk with people, you have to sort of think on their lines, right? Sherwin: So what were you working on before you were suspended? Bohm: I was working on plasma both before and after. I got a bit further after. Also I began to work on what I called the interpretation of the quantum theory. Well, I was doing a bit before, but I began to do it much more vigorously afterward, to question the interpretation of the quantum theory. I came out with a positive interpretation, another interpretation. Bohm: In the Physical Review. Sherwin: What’s the name of the paper? Sherwin: And that came out in? Sherwin: ’52. Did you see Oppenheimer during any of this time in Princeton? Bohm: He was at the Institute for Advanced Study, so I saw him occasionally. I had a few friends at the Institute, but I wasn’t very closely associated there. Oppenheimer was in another line. He didn’t sympathize with what I was doing in physics. He felt that I was making a mistake, that I should work on orthodox lines. So during all that time, we were not really in sympathy. But we did, perhaps, occasionally saw each other at the Institute or met on the street occasionally. When I wasn’t able to get a job, I went to see him and he gave me some advice to get in touch with the State Department to get a passport. I got an offer of a job in Brazil, and he sent a letter in favor of me [inaudible]. Bohm: Yes, well, that was very disturbing the way, he reacted. I asked him about it and he told me his nerve gave way at that moment, that somehow the thing was too much for him. Sherwin: That fits. Do you remember more about that conversation? Sherwin: When did you ask him that? Bohm: Well, it was probably shortly after the thing came out in the papers. I happened to be over there. Bohm: At the Institute. I recall I asked him and that’s what I recall him saying. Sherwin: That his nerve gave way. Bohm: Well, not in those words, but that’s what he meant. I can’t remember his words, but what it meant was that he has this tendency when the thing gets too much, he sometimes does irrational things. So he says he couldn’t understand why he did it. Bohm: Chevalier, right. I never knew Chevalier myself, but I could see that when Chevalier came to him with that story, he didn’t know what to do. He made the worse of all possible choices. Bohm: Because, first of all, he didn’t report to the FBI as he should have, really. Secondly, since he didn’t after several months, he should have just kept quiet. But his nerve gave way at a certain point and he felt he couldn’t keep it quiet. The whole thing was just foolishness. Sherwin: Yeah. Did you ever talk about him with other friends, other Oppenheimer students? Some sort of general views about Oppenheimer that you would like to share? Bohm: He’s a very complex character. When I first arrived there, I was very much attracted to him. I think everybody used to almost worship him when I was a grad student at that time. They felt that he was a really quite a remarkable figure, and had great expectations of him. But I think that he always had certain weaknesses. They came out as he went on with his attempt to engage in politic..
First of all, he was very much on the left in politics, obviously, it was well-known. The story I heard from people is, that when he came back from Germany in about 1932, he was regarded the great hope of American physics, that he could do something in America comparable to what was going on in Europe. It didn’t pan out that way. Sherwin: Let me ask you a question here. Did it look like it was panning out through the 1930s? Bohm: For a few years it may have looked that way, but he probably began to feel it wouldn’t happen. I had a relative called [Milton] Plesset, that’s who put me in contact with Oppenheimer. Sherwin: How do you spell that? Bohm: P-L-E-S-S-E-T. I don’t know where he is now, but he told me that already by 1940 that Oppenheimer had been regarded as a great hope, but it wasn’t working out. That he was not doing what people, the way had been hoped. So that was already circulating by 1940. Bohm: What I have heard otherwise is that he went in for politics, says he felt he had to do something on a worldwide scale, a historical scale. He went in for politics and hoped that that was where he could this. Then when the opportunity came to work on the atomic energy, he felt that would be it. When the war was over, he felt he would engage in politics through atomic energy on a worldwide scale and do something of real significance, which he tried to do, actually, in the Atomic Energy Commission. I mean, I think that what he tried to do was good, but he obviously wasn’t able to do it. Sherwin: It was certainly better than what was done. Bohm: Yeah, yeah. It would have been a lot better if he’d been able to do it, but he was not able. I think it was totally unrealistic to attempt. But there was a conversation he had with [Joseph] Weinberg once, saying that he felt he was going to do something to have some effect on history. I think that was part of his motivation. Bohm: It could have been around 1942 or so. Sherwin: This is before Los Alamos? Sherwin: Was he particularly close to Weinberg? Bohm: No, but he talked with him occasionally. Sherwin: He was closest to Peters? Bohm: I don’t even know that. He may have been closer to Peters. Certainly closer to Peters than to Weinberg, but I don’t know how close he was to Peters either. I didn’t know him all that well. I only met him a few—he was off to the war work soon after I met him. Sherwin: Right, right. How did you feel about him as a physicist after the war? You said that he disagreed with the approach that you were taking? Bohm: Yeah. I wanted to question fundamentals. He felt that one should work on using the present theory, exploiting it and trying to work out something of its consequences. What was the big thing at that time was renormalization. I remember we went to two conferences, one at Fire Island, and the other in the Pocono Mountains. The one at Pocono Mountains had [Richard] Feynman and [Niels] Bohr and all those people there. [Julian] Schwinger, that was when the thing came out with renormalization, and Schwinger. Shortly after that, Feynman did his work. Now, I think that Oppenheimer hoped that I would get into that sort of thing. But I was always trying to approach something more fundamental. Sherwin: Now what was your view of his mind as a physicist at that time? Bohm: In the beginning I had tremendous regard for him. But later I felt he was rather limited, that he was not really capable of—that’s, in fact, what Plesset told me, that he’s not capable of genuine originality, but that he’s very good at apprehending other people’s ideas and seeing their implications. In Los Alamos, it was really a very fine position for him, because he could see what people were doing and bring it all together. Sherwin: Did he do as well at the Institute for Advanced Study? Bohm: Well, there he didn’t have to do so much. Scholars there are more independent. Sherwin: How about in the selecting of the people, permanent staff? Bohm: I couldn’t say too much about that. Sherwin: I mean, specifically the physicists. Bohm: Well, he selected people, I don’t know on what basis. I mean, they seemed competent. But obviously, he selected them for that purpose, to fit in with his general approach. The ones he selected were very good at doing that. Sherwin: Were you at seminars with him? Sherwin: How would you describe his style in a seminar? Bohm: It was dominating. He tended, especially in the early days, to completely dominate seminars. He was really good, fluent with his words. He had a manner which would carry you along. He had a certain charisma, is the best way to put it. I think by the end of the war, he had begun to lose that charisma. I recall when we got to the Fire Island conference that he kept on doing that, and I began to think that he was talking too much. Whereas before the war, I would never have thought that. Bohm: But he didn’t have anything to back up—there wasn’t that much behind what he was saying to back up that much talking. Bohm: But that was probably because he hadn’t been doing real physics for many years. He had been doing this, directing Los Alamos, which was not actually physics. Sherwin: Taught there for how long? Bohm: About four and a half years. Bohm: To Israel, to the Technion at Haifa, that was a bit over two years. I met Sarah [Woolfson] there, and we got married and then we came to England, Bristol, in ’57; ’61 to present position in Berkeley. Sherwin: Now, when you left the United States, did you just sort of leave all this behind? That is, the whole political turmoil? Bohm: I didn’t engage in all that politics after that. I was still somewhat sympathetic to the left. Sherwin: Did you stay in touch with Lomanitz? Bohm: No, not really. I met Lomanitz later, much later. He came to England, I had a bit of a talk with him. No, we weren’t very close. I feel that my views have developed in a direction which isn’t close to Lomanitz. He wanted me to come over there to Socorro for a while, but I didn’t. Sherwin: Your political or your physics views? Bohm: In general, all the views. Sherwin: What kind of physics does he do? Bohm: I can’t even say for sure now, but he was more interested in logic and things like that. I met Friedman, he came to visit England briefly. Of course, he’s lost interest totally in politics, too. He immersed himself in his university work. Sherwin: Did he know Oppenheimer? Sherwin: I see, okay. Secretary Henry Stimson, the Secretary of War at the time, was led to believe by [General Leslie] Groves and various security officers that the Russians were receiving information from various people at Berkeley, at the Radiation Lab. Do you have any sense or anything at all? Bohm: No, I wouldn’t. Many people all around knew roughly what was going on in Berkeley at that time, people out of the project. It was fairly clear that something was going on, and it didn’t take much to piece it together seeing all those physicists coming, eating lunch in the cafeterias there. Sherwin: But that wouldn’t be unnatural at Berkeley, since [Ernest] Lawrence had his group? Bohm: No, but it was on a scale which would have been far beyond anything that Lawrence would have wanted to do. I think that anybody could have seen something is going on there. This big expansion, people used to talk about, “The great thing.” Or I can’t remember the words they used, but implicating that there’s something going on there. I mean I couldn’t say whether anybody contacted the Russians. But I knew of no such contacts. I think the Russians got tremendously a lot more information out of books in that group. Sherwin: Oh, yeah, no question. Bohm: Whatever they got from Berkeley would have been trivial anyway, the sort of thing that could have been known anyway. Any reasonably intelligent physicist could probably have pieced together what they were doing at Berkeley, just by seeing who was coming there and the scale of the operation. Sherwin: Yeah. Now, did you need a security clearance to do what you were doing? Bohm: Yeah, well, I had some sort of clearance there. Sherwin: You worked through the war at Berkeley? Bohm: Yeah, well, that was where they made—I think that what you could have learned from Berkeley was that they were interested in isotope separation. One could think they might be working on a bomb, but there was no information available in Berkeley as to how this bomb would work. That I can tell you, but certainly, I never encountered any. The sort of thing that they were working on, it would only be [inaudible] [0:01:35] information that the American government was taking isotope separation seriously and perhaps was able to separate isotopes on a large scale. That’s about all anybody could have learned. I think any reasonably intelligent physicist could have guessed that by just visiting Berkeley. Sherwin: Right. Let’s see. I think Weinberg, is he at Syracuse? Bohm: I don’t know where he is now, but I think that’s what I last recall. Sherwin: But you don’t keep in touch with him? Sherwin: Okay, let me go back to the 1930s then, and ask you about the left at Berkeley at the time. How would you describe the general atmosphere among physicists who had political consciousness about political activism, about the Communist Party? Sherwin: Well, when you were at Berkeley, which is ’41, ’42. Bohm: I think that was sort of the tail-end of this activity. It was already dying away. I think that except for a small circle, I knew that most physicists probably are not really that interested in politics. Certainly, I never encountered among physicists previously any great interest in politics. I think that in Berkeley, the whole atmosphere of the ‘30s must have produced a strong interest. Oppenheimer probably took part in that. Sherwin: Where were some of the meetings, for example? If I’m going to describe all this, it would be useful to have a sense of the scale. Sherwin: Of the activity of the Communist Party in Berkeley. Bohm: Well, yes, I couldn’t give you much. The people I was with would meet in a room like this; somebody’s house. Sherwin: So, we’re talking probably about twenty-five people? Bohm: Well, there were probably other groups. I heard mention of other groups. Sherwin: Right, but I mean the one that you were associated with. Bohm: Yeah. So the scale was nothing much. I had the feeling was, that they were really rather ineffective, that’s all. Sherwin: Were most of the people in your group scientists? Bohm: No, no, no, all sorts of people. Bohm: Local people, yeah. There was some mixture. Sherwin: The activities? There were some protests? Bohm: They tried to organize protests about conditions on the campus. Sherwin: Working conditions for the secretaries? Bohm: No, I can’t remember what about. About the treatment of students, or sometimes about working conditions. Sherwin: Anything on a larger scale, like civil rights type of activities? Bohm: They were not doing a lot of it in those days. I think there was a tremendous emphasis on helping the war effort at that time. So they were not out to rock the [0:06:00] boat. Sherwin: Right. Did you meet Frank Oppenheimer then? Bohm: I only met him through his brother. Bohm: Yeah. There was a tremendous blowup as to whatever the Communist Party was able to do. It really was not a tremendously significant group, as far as I could see at that time. I can’t see that any information available at Berkeley, if it could have got to them, would have made a great difference. The Los Alamos information is entirely different. Sherwin: Yes, yeah. When did you first hear about Oppenheimer’s testimony? Bohm: Oh, probably after the war, I guess. Sherwin: No, no, the testimony for his hearing in ’54. Bohm: Oh, well, I was down in Brazil. Sherwin: How did you hear about it? Somebody write to you? Bohm: No, I suppose there was something in paper, perhaps. Perhaps it was in Time Magazine or something. Sherwin: Were you mentioned in anything? Bohm: I was mentioned somewhere. I think that I was mentioned in the sense that one of the accusations against Oppenheimer was that he did write a letter in my favor. Sherwin: Yeah. When you read the testimony—did you ever read the whole thing? Bohm: Well, I read it much later, but, at least a considerable part of it. I just felt that they were out to get him, politically, that it was all trivialities. Bohm: No, he’s not responsible. No, he helped me to get into Berkeley and he helped me to get Brazil. I can’t blame him for not liking what I’m doing. Bohm: I think he acted fairly to me, as far as he was able to. Sherwin: What’s your sense of how he behaved towards some of the other young physicists? Bohm: Well, there was Peters, and he explained that. Now, I can’t see that he did anything terribly wrong with the other physicists. Sherwin: Because there certainly was a core of people, and [Edward] Condon at point being among them, and some others, too, who were very down on Oppenheimer, and are still very down. Bohm: Yeah, well, I think they knew him better. Some people who knew him better are very disappointed in him. They feel that in some way he betrayed their ideals, perhaps. But I was never that close to him. I think that he did have opportunistic tendencies. He made it clear somewhere, some of the things he said, that he felt that when he was a child, that he felt very insignificant often. He somehow felt under compulsion to do something significant. Now, that was really what moved him [inaudible] things he did. I think that because he shifted from one thing to another in his search for something significant, that some people said he betrayed them, that he just left and went to the other thing. But that’s my guess. But I can’t say that he really ever did me any serious harm. He did try to help on several occasions, and I can’t say that I’m worse off as a result of having to leave America. Sherwin: You’ve been able to do your physics. Bohm: Yeah. I may be better off. Sherwin: You’ve seen a lot of interesting places. Bohm: Yeah. Or else I may have more [inaudible]. Sherwin: One last question. In the Oppenheimer testimony, it’s reported that Eugene Wigner threw a going away party for you? Bohm: Oh, yeah, that’s true, yeah. Bohm: No, I was surprised myself. Sherwin: Oh, you were, okay. Bohm: But, anyway, it was a good surprise. Sherwin: He was still conservative? Bohm: Yeah, but I meant that he didn’t approve of my politics, but he did throw the going away party. Since that time, we have been quite friendly. No, I would say I, myself could no longer feel as I did that the left politics would solve the problems of mankind. I know that I was a bit naïve, but at that time, it did seem to me that it might.